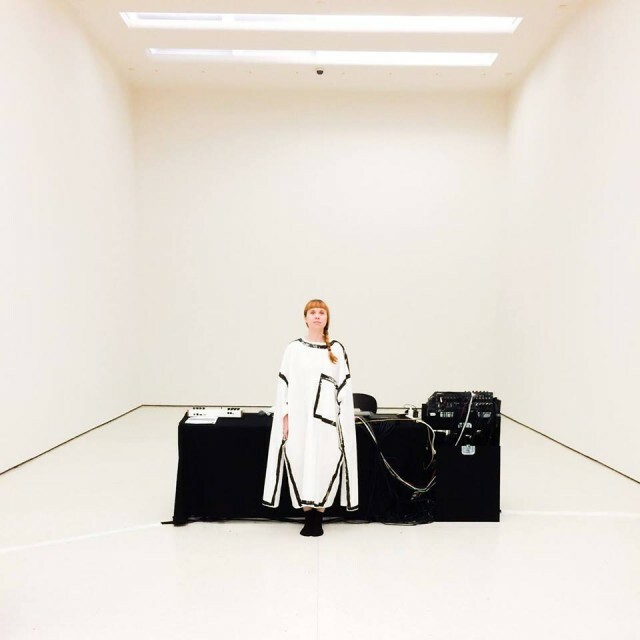 I’m remiss in not posting this last week when it debuted, and I suspect many CDM readers have heard already, but if not – drop everything, and have a listen (in full) to ‘Platform,’ the new LP from composer/producer Holly Herndon. The full LP is now on Spotify, etc., or NPR First Listen. But because those are all wonderfully deep rabbit holes into which to climb, I think it’s best to start with the music. Hearing them for me had an odd sense of familiarity. I’d heard some of these track in some form in a couple of live shows, but to me, that sensation with music is a flag that I should pay close attention to what I’m hearing. Pop or “hooks” or not, there’s something that happens when a composition works, a way it finds its way into your brain. It sounds like you’ve heard it before the first time you’ve heard it, and stays with you and makes you want to hear it again. Because this record is in the mainstream press, you’ll see some writers stumble around odd descriptions like “techno.” But it seems to me timeless, genre-less. Part of its genetic code is modern: this dense forest of repeated samples and slices, a self-awareness and comfort with the means of production. Another part feels like a modern answer to much earlier work of Eno, Laurie Anderson, retold by a generation that grew up with those sounds. But from that soup comes tracks that feel like songs, feel fully formed, get into your head. In between, there are also great moments of theater and wit, so I’ll be curious to see where the “platform” leads. But more than that, blending her voice digitally through the whole spectrum, Holly makes her music really sing. To be a platform for technique and higher concepts, I think that’s essential: the machine has to have a voice, and more than ever, you have the feeling Holly has found her voice. I’m writing I know largely to producers (hello, CDM nation). And I know many of you, like Holly, have brains crammed with technical knowledge; many of you have tried to mediate between cultures like dance floors and academic music labs. My sense on “Platform” is of an artist who found a way to speak and sing with that voice, literally and broadly. I don’t think your voice will necessarily sound like Holly’s. But I hope this is the sign of more music to come. Ever since I released my first album a couple of years ago, I have been humbled to see just how far my alien songs can travel. Thanks to a tireless community, it has been an incredible few years for experimental music. Abstract sounds are being embraced far beyond their traditional niche, and it made me wonder, what can be done with this new opportunity? Holding hands with a wider audience, can we channel abstraction towards greater action? For this reason, Platform demanded to be a collaborative project, and I feel so grateful to have worked with some of my favorite artists to pull this together. Metahaven, Mat Dryhurst and Matt Werth have been a pivotal inspiration from the beginning, and Colin Self, Amnesia Scanner, Claire Tolan, Spencer Longo, Amanda DeBoer, Akihiko Taniguchi, Cuahtemoc Peranda, Stef Caers and Mark Pistel have all played crucial roles in this release. Thank you! Many great minds have inspired pieces on this record. The ideas and spirit of Suhail Malik, Benedict Singleton, Jacob Applebaum, Keller Easterling, Guy Standing, Reza Negarestani, Amber Case, Benjamin Bratton, Hannes Grassegger, Jacob Applebaum, Laura Poitras, Nick Srnicek, Brian Rogers, Amber Halford, Nathan Jurgenson and Barry Threw regularly appeared in our discussions and continue to influence our aspirations for Platform going forward. Thank you! We have received generous support from many several organizations for which I am really grateful – Lighthouse, CCRMA, Wallris. Thank you! This album is just the beginning of a greater project, and I’m ecstatic to have partnered with 4AD and RVNG Intl on this journey. We need new fantasies, new archetypes, new strategies and new ways to love. All of the power we need to make something special happen may well be found in the rooms we dance in. I hope we get into these other conversations and hop on this ‘platform’ with the artist in coming weeks. In the meantime, some reading to get you started, and hopefully inspire some other conversations to have. Robert Henke last month at NODE Festival used a panel I was moderating to argue that the laptop needed to go away, as I understood it primarily because he wanted to make music away from the machine that brought all these rivers of information and communication. (Sincere apologies to Robert; I think I practically shouted at him when he told me that’s what he wanted to talk about, as I was afraid it’d derail the entire panel in a whirlpool of unsolvable and oft-repeated design critiques of the machine and I decided, selfishly, I mostly wanted to talk about something else.) But Holly reframes the whole question in an interesting way – if a challenging one, since it makes us consider the machine as an object, as an instrument, and as the emotional-social context for the music itself. Remember when I talked about rabbit holes? Yes, see you in Wonderland in our next installment. Out now on digital, CD, vinyl. Wait, let’s here still more… Recommended by my friend chaircrusher, don’t miss this collaboration with Jlin, from Gary, Indiana. And while the American press get hung up on “techno” – and Holly’s stint (and regular visits) to Berlin – I think they’re ironically missing some really important character in her music that isn’t from Berlin and isn’t from techno (at least in their present iterations here). Even here in the German capital, a small but growing group of artists look to the US for footwork and bass music and an antidote to the gloom and sparseness of the current trend lines in the techno scene. So, when Holly plays Berghain next month, she can also bring a breath of fresh air. Actually — scratch that. This track is fresh enough that it doesn’t really need any analysis. But what you will here is the same personality that shines through on the new record. And breathing personality into machines is what electronic production is all about. And here’s to the Gary, Indiana – Tennessee by way of Berlin and CCRMA pathway for these two fine artists.